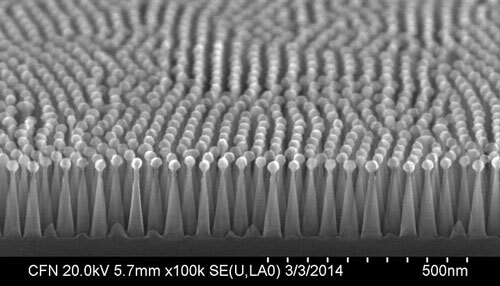 (Nanowerk News) Reducing the amount of sunlight that bounces off the surface of solar cells helps maximize the conversion of the sun's rays to electricity, so manufacturers use coatings to cut down on reflections. 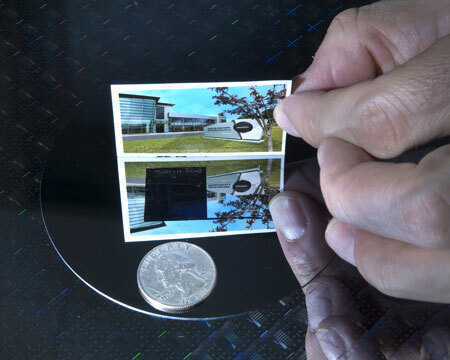 Now scientists at the U.S. Department of Energy's Brookhaven National Laboratory show that etching a nanoscale texture onto the silicon material itself creates an antireflective surface that works as well as state-of-the-art thin-film multilayer coatings. The scientists started by coating the top surface of a silicon solar cell with a polymer material called a "block copolymer," which can be made to self-organize into an ordered surface pattern with dimensions measuring only tens of nanometers. The self-assembled pattern served as a template for forming posts in the solar cell like those in the moth eye using a plasma of reactive gases—a technique commonly used in the manufacture of semiconductor electronic circuits. "This is a powerful advantage of doing research at the CFN—both for us and for academic and industrial researchers coming to use our facilities," Black said. "We have all these experts around who can help you solve your problems."